I hope that you are enjoying a wonderful Holiday season with loved ones, and that your stress is minimal. I hope this is a time of respite and reflection on the year behind, and optimistic planning for the year ahead. I wanted to thank you again for a fabulous year, and tell you that all of your support, your participation on tours, your real estate business, and your generous referrrals of friends and family have meant the moon. And by the way, I am NEVER too busy for your referrals! Speaking of referrals, I’ve had a number of conversations in recent weeks with folks who have shared some misperceptions when trying to refer friends and family looking to buy or sell in the 2019. I hear these same four misplaced beliefs from time to time, so I wanted to dispel some of the myths, as it can actually be quite detrimental to navigate a real estate transaction solo. 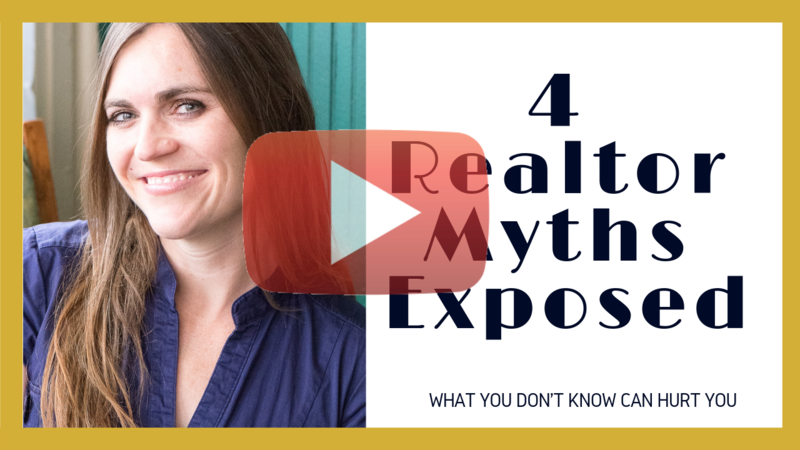 So here they are, the 4 Realtor Myths Exposed…. Myth #1: I have to pay to work with a Realtor. Actually, you have to pay to buy a house. In the vast majority of cases (and 100% of the work that I do), realtors’ fees are not paid by the buyer, but actually by the seller’s proceeds at closing. Buyers never pay their realtor, and thus they have no risk to engage an expert who will help them to navigate the rapidly changing market. Someone who will protect their money and their best interests. The amount that both a buyer’s agent and a seller’s agent are paid is predetermined by the seller and their agent before the house is even on the market, so it’s not something that effects the buyer in any way. Myth #2: I will save money on the transaction working without a Realtor/My offer will be more competitive if I don’t have a Realtor. Remember we just established that buyer’s agents are only paid from seller’s proceeds, and not at all until the property closes? And remember that that amount was determined long before the house came on the market and a buyer put an offer in? What happens if you put an offer in without a realtor is typically that the seller’s agent becomes a transaction broker for the deal. A transaction broker is a neutral party that basically oversees the paperwork; they cannot advise you or advocate for you as the buyer. In other words, if you’re paying way too much money, they can’t tell you that. If there’s major issues at inspection or you want to know subjective opinions about resale, they won’t advise you. You’re pretty much on your own. And that money you thought you were saving the seller? It all goes to the transaction broker (the seller’s agent), because they agreed to pay that amount regardless of how the house was sold. So you stand to lose quite a bit of money and go it alone without someone in your corner. Myth #3: I don’t need an agent if I’m buying New Construction. It’s easy to see where this mispercetion comes from….you go to a new build site and there’s a beautiful sales office with sales representatives chomping at the bit to help you get your new house. They have a team of people that oversee the process. So you’re good, right? Wrong. Because who does that salesperson and that team work for? Here’s a hint: it’s not the buyer. Everyone there works for the builder, and they’re paid to sell houses, and to get as much profit as possible. Having an agent represent you in a new build is imperative, as there are tons of details and logistics to oversee and you want someone advocating for your best interests every step of the long process. I’ve worked with a number of clients to buy new builds this year, and I will tell you a lot of issues can arise. And a lot of money can be saved- I recently uncovered $6000 worth of incentives that weren’t advertised just by sitting down with my client and the sales reps. If you’re even wanting to explore buying new, I highly recommend bringing an agent to that first visit. And here again, the buyer doesn’t pay the agent, the builder does, so there’s no risk to getting a professional opinion. Myth #4: I don’t need a Realtor if I’m buying with cash. I’m not really sure where this one comes from, as the way a buyer finances their purchase really doesn’t have much to do with the realtor. Whether you are financing a purchase with a conventional, FHA, VA loan, or with cash, the process of the transactions and the potential pitfalls are exactly the same. In fact, I think using cash is all the more reason to use a realtor, frankly, as you’re putting forth your own money, not a bank’s. Thus you really want to make sure that you’re getting a good price, that the underlying issues in the home aren’t going to cost you in the future, and that everything goes smoothly. In addition, cash transaction typically go much faster than lender-financed ones, and so having someone who is in the weeds daily navigate the rapid transaction can be critical. And once more, a cash buyer isn’t paying for a buyer’s agent any more than a lender-financed buyer. Say it with me everyone: the agent is paid from seller’s proceeds, and paid only when and if the transaction closes. Hopefully that helps dispel some of those mispercptions, and gives you some insight into how to help friends, family, and yourself to make educated decisions, keep as much money in their pocket, and have smooth real estate experiences.